Pics UK IT supplier Boston is not waiting for ARM-powered servers to take off before jumping into the racket - instead it's getting out there on the bleeding edge and will within weeks start shipping the first of its "Viridis" energy-efficient servers. Viridis is a Latin-ish name that is derived from "green" and is meant to signify the energy efficiency that comes from using ARM processors to do heavy lifting - and presumably the greenbacks from hyperscale data centers and other hosting customers looking for better power efficiency and compactness than is available with x86 iron. Boston has partnered with Calxeda, the ARM server chip startup formerly known as Smooth Stone, which has been working with Hewlett-Packard on its "Redstone" hyperscale servers. Calxeda timed the launch of its 32-bit quad-core ECX-1000 ARMv7 CPU variants back in November 2011 when HP desperately needed some good news to get everyone to stop thinking about the CEO musical chairs at the IT giant and its own restructuring woes. Calxeda has created a server board that has four ECX-1000 processors on it and makes use of the integrated distributed Layer 2 switch on each chip to lash them together into a cluster without needing to buy an external switch. That switch can, in theory, scale up to 4,096 sockets using 10 Gigabit Ethernet links. The Redstone machines have 18 of these four-socket server cards in a single tray and up to four trays in a ProLiant SL6500 chassis. You can cram 288 server nodes in a 4U chassis; there's no storage, but as El Reg reported at the time, you can pull out some server boards and put in storage boards (with 2.5-inch disk drives or solid-state drives) allowing up to 192 SSDs or 96 disks per 4U enclosure. The HP Redstone machine gives you 72 servers per rack unit, and that was about 20 per cent better server node density in a rack than Calxeda was talking about delivering with its alpha server designs back in March 2011. "This is a real machine, and it is in the labs now and we will be shipping the first products at the end of the month," says Johns. "This is for proof of concept customers to do their development and testing work. We will have variants further down the road." You will have no doubt noticed that there are 48 server nodes in the machine but only 24 disk drives, but Boston can switch to a higher 4U chassis and boost the disk count significantly, and can even push it far enough for disk-intensive workloads like Hadoop big data munching. All in good time. For a lot of workloads, where local storage is not necessary, Boston expects for customers to go diskless. Obviously there is plenty of room in a server chassis to put more EnergyCard server nodes into the box. The dozen processor cards including memory burn only 300 watts. Johns says the redundant power supplies in the SC216 chassis are probably a little overkill for the processor and disk load and could be scaled back to run at closer to peak power and therefore more efficiently. Boston is using the Calxeda reference backplane boards at the moment - known by the name SP12 - in the Viridis server, but will begin building its own backplane boards starting in August. The company will also make its own disk add-on cards to plug into the backplane next month. The company could do a micro server form factor to boost density as well, hints Johns. Boston is right out there on the cutting edge of the Linux operating system by using Canonical's Ubuntu 12.10 and Red Hat's Fedora 17 development releases on the impending Viridis machine. This is because they have better support for ARM processors, and Calxeda's spin of them in particular, than Ubuntu 12.04. 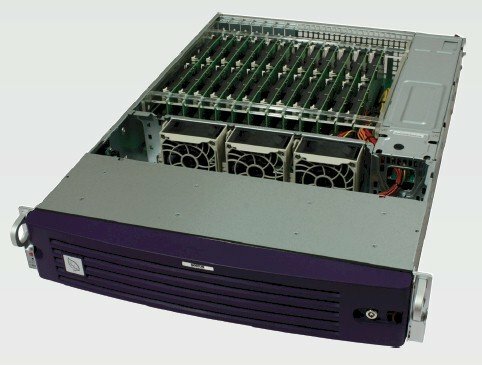 A fully loaded Viridis server including the dozen cards (that's 48 processors and 192 cores) with a total of 192GB of main memory and two dozen disks costs $50,000. That includes all necessary networking between the nodes, since the EnergyFabric distributed Layer 2 Ethernet switch is spread out across each ECX-1000 processor. That's a hair over $1,000 per server including storage and networking, which is quite astounding. (The Redstone developmental machine costs $750 per node, but does not include disk storage.) That Viridis server comes with three years of on-site warranty support and unlimited tech support, so you can pester the Boston techs all you want. The company is selling the initial Viridis machine in the United States, Europe, and in Asia, and has lined up 20 customers for beta testing already. The company has a pipeline of hundreds of potential customers already, including those doing traditional HPC simulations (believe it or not, and this machine would be great at bioinformatics and genomics) as well as customers in financial services, oil and gas, defence, and broadcasting. Of course, the big question is whether Boston will be doing low-powered Viridis server designs based on future Intel and AMD processors or any other ARM processors.